The Occupational Safety and Health Administration is responsible for ensuring that businesses adhere to fire safety in the workplace. In addition to regulations on the amount and placement of portable fire extinguishers per square foot, businesses may be required to have annual inspections, conduct regular visual maintenance checks, have hydrostatic testing every few years and recharge the extinguishers annually or anytime the extinguisher has been used. Employers may also be required to provide employee training on the proper use of an extinguisher. Start a fire extinguisher recharging business to serve local business owners, government and homeowners. Establish and register your business with your county clerk. Contact your licensing department to learn the minimum insurance requirements for your business. Undergo a portable fire extinguisher training course from a state-approved company and pass the exam. 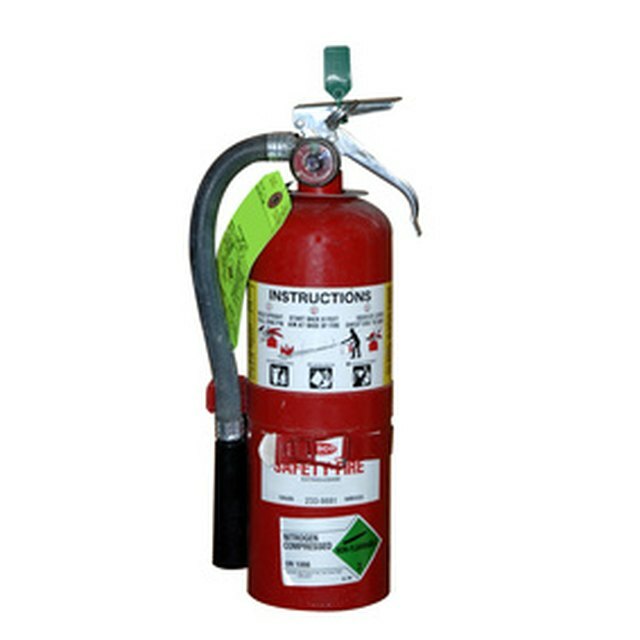 Learn the NFPA 10 Standard for portable fire extinguishers. Visit the National Fire Protection Association, an international nonprofit organization and the leading authority on fire safety, to find training and certification programs available. Contact the U.S. Department of Transportation to apply for a hydrostatic testing permit if you intend to service high-pressure fire extinguishers. If servicing portable extinguishers or low pressure extinguishers, this isn’t necessary. Apply for a Class A hydrostatic testing certificate with your licensing department and pay the applicable fees. Procure a commercial vehicle, uniforms, testing equipment, fire extinguishers, first aid kits, safety products, signs and labels, Exit lights, batteries and office supplies. Provide on-site training for new hires at local companies to teach them proper handling and use of extinguishers and consultations for supervisors or company owners to ensure that they are compliant with OSHA regulations and that they have established a secure evacuation plan. Contact local businesses, apartment complexes and real estate agents and ask them how satisfied they are with their current extinguisher refilling company. Contact construction companies to get first pick with new businesses. Offer free smoke alarm testing with each installation. Establish a relationship with a local fire department to further establish yourself in the community, help spread fire safety awareness and garner more business. Consider offering kitchen exhaust hood cleaning and pressure washing services as a way to supplement your income. Develop a brochure and website that details the scope of your services, such as inspection, recharging and installation. Offer free smoke alarm testing with each installation. Establish a relationship with a local fire department to further establish yourself in the community, help spread fire safety awareness and garner more business. Consider offering kitchen exhaust hood cleaning and pressure washing services as a way to supplement your income. Develop a brochure and website that details the scope of your services, such as inspection, recharging and installation.